"On this day O Beautiful Mother" ... Blacklisted? ELOW, I quote from an article [pdf] by Fr. Francis Brunner. I will explain why a little later. First, a quick word about the background. The article was published in the 1953 Caecilia Magazine (Vol. 80, No. 4). During those years, the editorial staff for Caecilia included many “big names” like Theodore Marier, Fr. Elmer F. Pfeil, Fr. Francis Brunner, and others. These days, Brunner is remembered primarily for his English translation of Missarum Sollemnia (“The Mass of the Roman Rite: Its Origins and Development”) by Fr. Josef Jungmann, S.J. This is a two volume set, and each page has a whole bunch of footnotes. I am told that some joker actually published this book as a single volume . . . by leaving out all the footnotes! How incredible! How reprehensible! The primary value of Jungmann’s work these days is found in the footnotes. Years ago, Jungmann was taken very seriously, in spite of some embarrassing episodes, such as the one I describe in this article [url]. However, when “the dust settled” on his scholarship, it was found that he fell into the same trap as so many other historians. 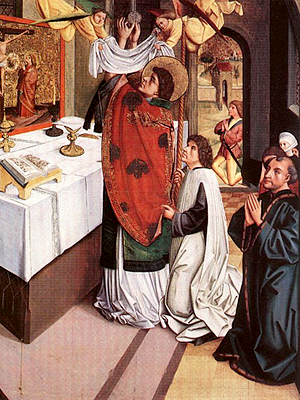 Jungmann would find evidence of a liturgical practice in some ancient manuscript and assume that the practice was widespread and/or universal in the Catholic Church at that time. This is an unfortunate trap to fall into, because the responsible historian realizes that the mere fact that some practice is described in one manuscript or another does not necessarily mean the practice was universal. In fairness to Jungmann, his scholarship was incomplete, because when he got close to publication, he was chased out of his city by the Nazi armies. As you might imagine, Jungmann was not able to carry with him all the books he needed, which made it very difficult for him to complete his “masterpiece” in an adequate way. That being said, his work is still very valuable on account of the footnotes (as I’ve already mentioned), and Fr. Francis Brunner did the world a great service by making an English translation of Jungmann’s German text. Q. According to the “White List” the “St. Basil’s Hymnal” is on the list of disapproved hymnals; however, it is the only hymnbook which contains “On this day O Beautiful Mother”, which is much loved hereabouts. Would you tell me whether that piece is suitable? A. The whole question of hymnody is so tangled and twisted, that it is generally difficult to give a straightforward answer regarding particular hymns. There is the problem of the verse — some of it atrocious as to form, some of it equally atrocious as to content. There is the question of melody — sometimes unsingable, sometimes worldly in tone, sometimes trite and inartistic. Catholics in America have been the heirs of a sentimental and subjective hymn tradition that, for some reason or other, has taken a deep and fast hold on the fancy of the average person. And no one has yet had the courage to do anything about the problem that is thus created. However, in the case of the piece mentioned in the question, this writer would venture an unqualified “unsuitable, unfit.” The verse is the sort that is unsubstantial and sugary. The musical setting is waltzy. Read the words and tell me what they convey to you. Then dance to the tune, and you’ll understand what I mean. Catholics in America have been the heirs of a sentimental and subjective hymn tradition that, for some reason or other, has taken a deep and fast hold on the fancy of the average person. I rejoice, because these words by Fr. Brunner are in accord with the other authors I have quoted. After all, when somebody “tosses out” statements like that, it can be difficult to believe, unless many authors say the same thing. We worked very hard to choose ONLY the finest hymns for the Campion Hymnal [url], and I could not be happier with the final results. Laudetur Jesus Christus in vitam aeternam!